The Gelid Tranquillo Rev.4 uses four power heat pipes and a special heat pipe constellation to achieve the best heat transfer from CPU core to the aluminium fins in its class. 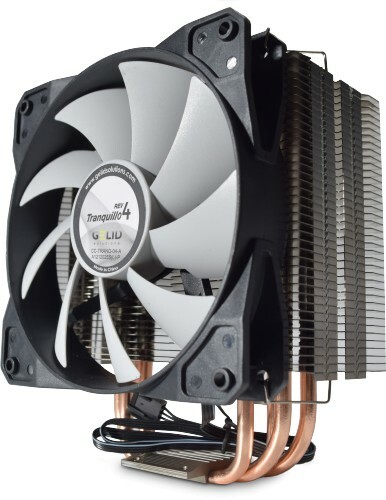 Like the original design the Tranquillo Rev.4 uses four power heat pipes and a unique heat pipe constellation but also comes with a number of new technologies implemented to achieve higher cooling performance. The Tranquillo Rev.4 features the Heatpipe Direct Touch Technology, a direct thermal connection between CPU core and heat pipes. 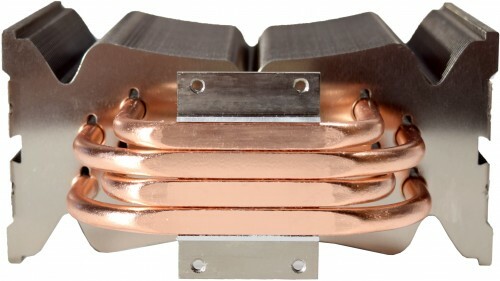 The new heatsink is also improved with the unique heatsink shape technology, the result of precise software simulations and calculations which makes the air flow resistance of the new heatsink much lower. The Stacked Soldered Heatpipes and Fin Technology provides the best quality of soldered joints between the heatpipe to fins and ensures the most efficient heat transfer inside the new heatsink. An improved 120mm fan with the intelligent GELID PWM (Pulse Width Module) control complements the heatsink. The new Double Layer Blade technology is applied to distribute air flow efficiently at low speed with a redesigned PWM IC eliminates any clicking noise. 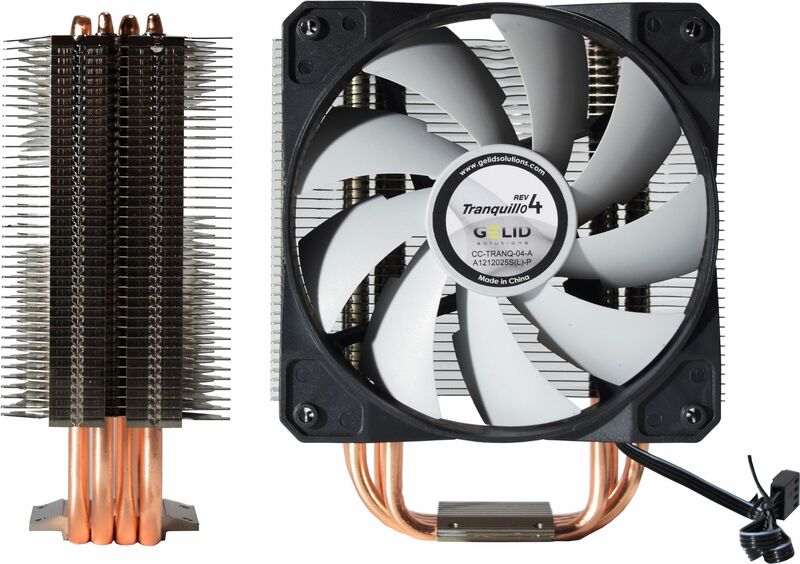 The intelligent GELID PWM curve operates the fan in speed range from 750 RPM to 1600 RPM, it constantly keeps the fan quiet but accelerates speed when additional cooling is needed. With the two sets of fan mounts, a second fan can be installed to improve the cooler's performance even further. The multi-award winning high performance GC Pro thermal compound is already included in the package. Mounting clips for multiple AMD™ CPU sockets AM2, AM2+, AM3, AM3+, FM1, FM2 and for Intel™ CPU LGA 775, 1366, 1155, 1156, 1150, 1151 sockets, as well as back plates for AMD and Intel mainboards are all included too. You can now use the Tranquillo Rev 4 with socket LGA2011 motherboards thanks to this LGA20111mounting kit.